Prestashop RMA module provides a seamless process for customers to return their products to store and get a refund or replacement or repairment for the return made. 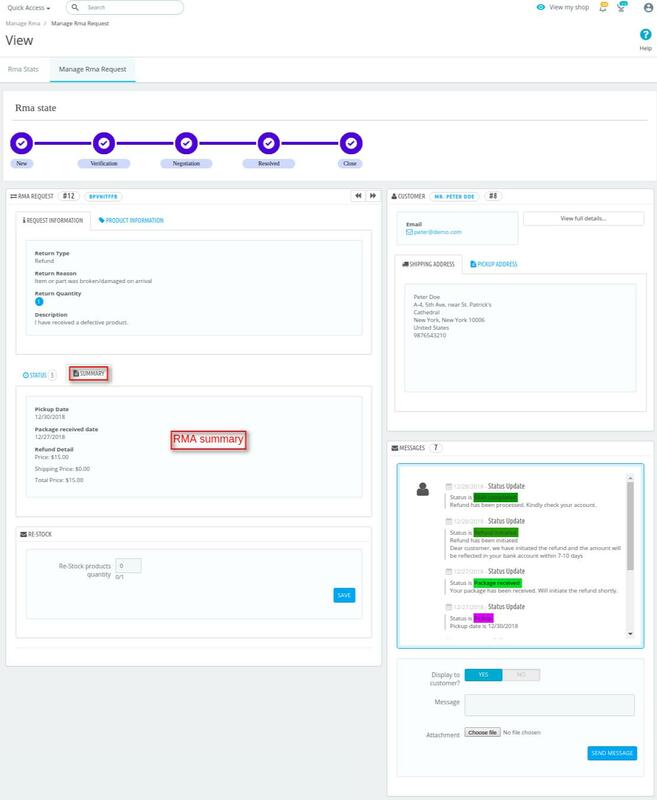 The store admin can manage all the RMA requests placed by the customers from the backend. Detailed statistics on RMA requests for refund, replacement, and repair helps the store admin build strategy to reduce returns on the store. Hassle free returns process helps the store admin in retaining the existing customers and attracting potential customers to the store as well. Configure the order status(es) on which RMA requests can be placed. The store admin can enable/disable the product pickup facility. Email to admin on the RMA request generation by the customer. An inbuilt conversation system through which both admin and customers can communicate with each other. Email notification to admin for every message sent by the customer. Select a separate email id for receiving RMA request emails. The store admin can select the return address where customer needs to send the package in case pickup facility has been disabled. The store admin can add and manage RMA status and the return reasons. Select the category(ies) for which the return reason will be applicable. Add and manage RMA policies for refund, replacement, and repairment. Select the specific category(ies) and product(s) on which the RMA policy will be applicable. Admin can refund for the product amount and shipping amount partially or in full. 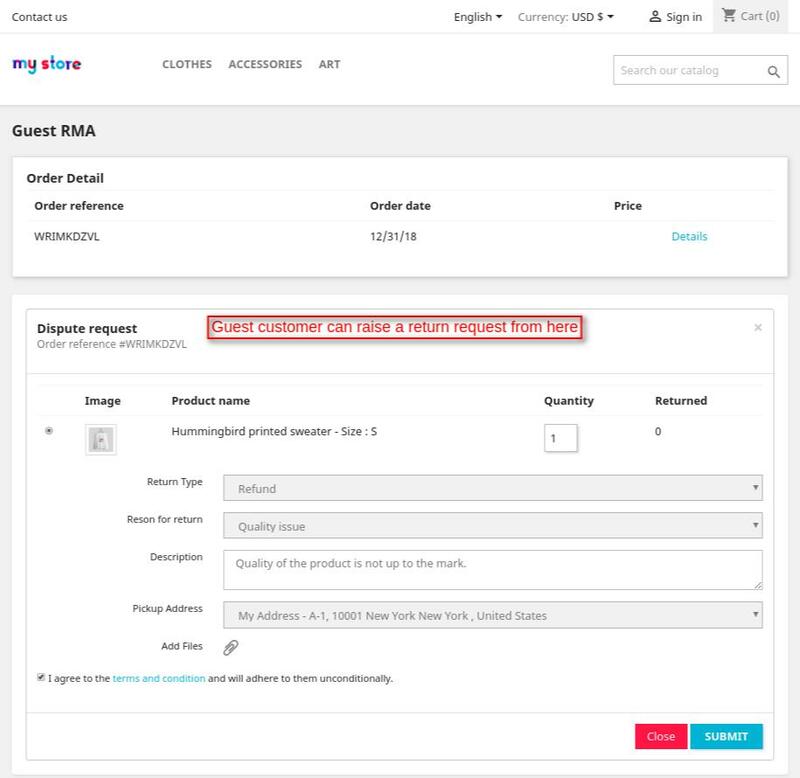 With restock products quantity feature, admin can return the product(s) quantity to the store for which RMA request has been placed. 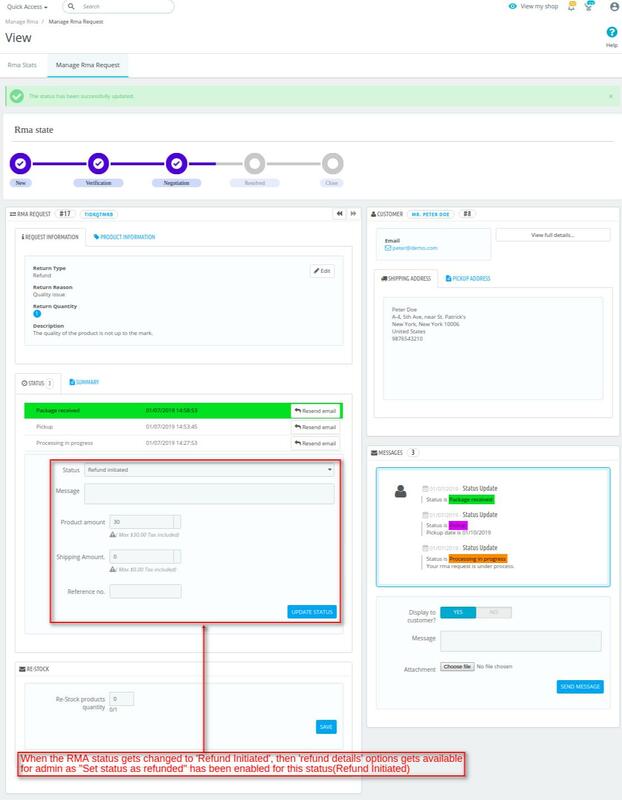 Admin can view the conversation history between it and customer from the backend. The store admin can add the notes regarding RMA requests for its own reference. A separate panel for admin from where it can view the total number of RMA requests placed products wise and customer wise. Allows customers to request for the refund, replacement, and repairment for the products purchased within a limited period of time. A message to the customer whenever admin updates the RMA status. 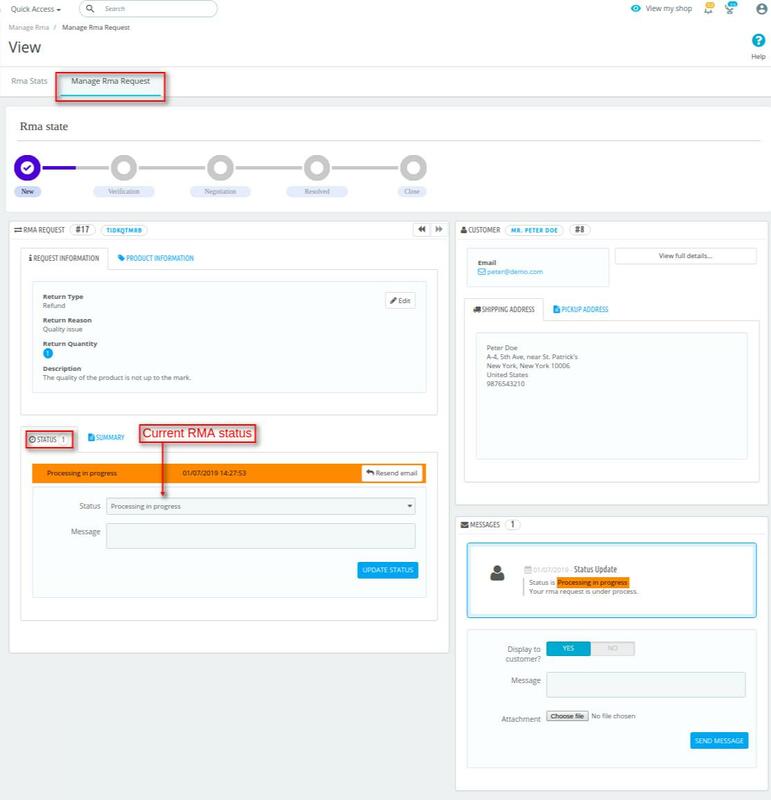 Customers can view current RMA state, RMA status, and product details for which RMA request has been created at the front end. 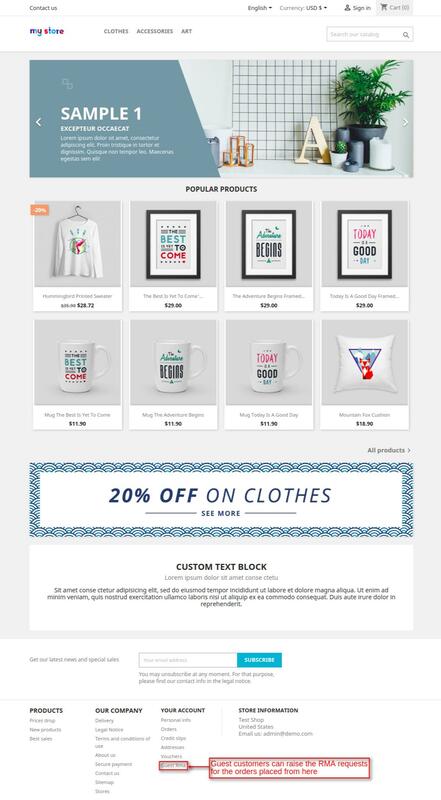 Email notification to the customers for every message sent by admin. Email notification to the customer whenever the status of RMA request changes. Customers can view the list of products for which they have placed an RMA request. Guest RMA feature through which the guest customers can also raise RMA request for the orders placed. Go to the back office-> modules -> modules & services -> Upload a module. Upload zip file of “Prestashop RMA” module. After the successful installation of the module, a new tab “RMA Management” gets available for admin from where it can configure the module settings. Under “Settings”, admin can configure the module’s general setting, RMA status/reason, and RMA policies. 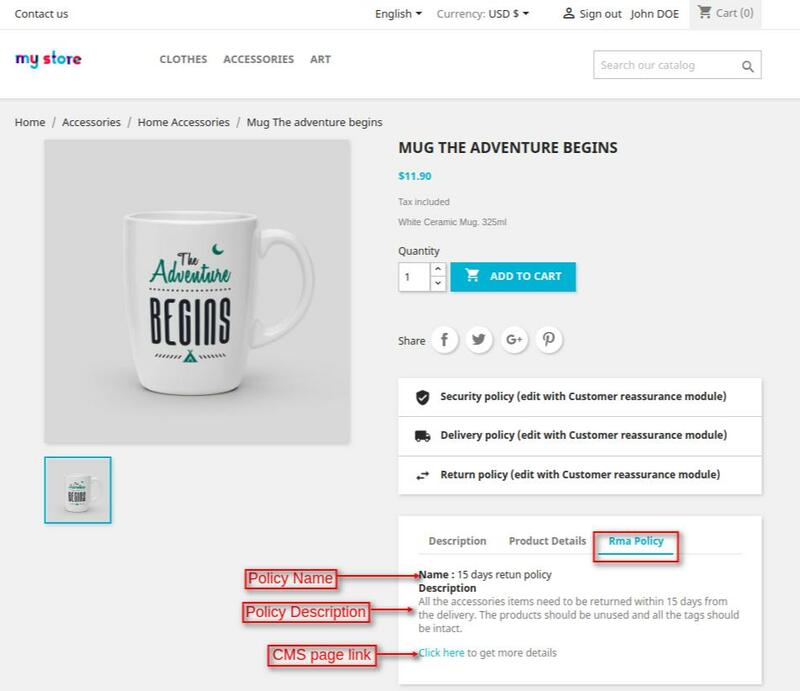 Under “Global Configuration”, the store admin has to select the order status for RMA, CMS page for terms & conditions, RMA policy which will be applicable on product return, and default RMA status. 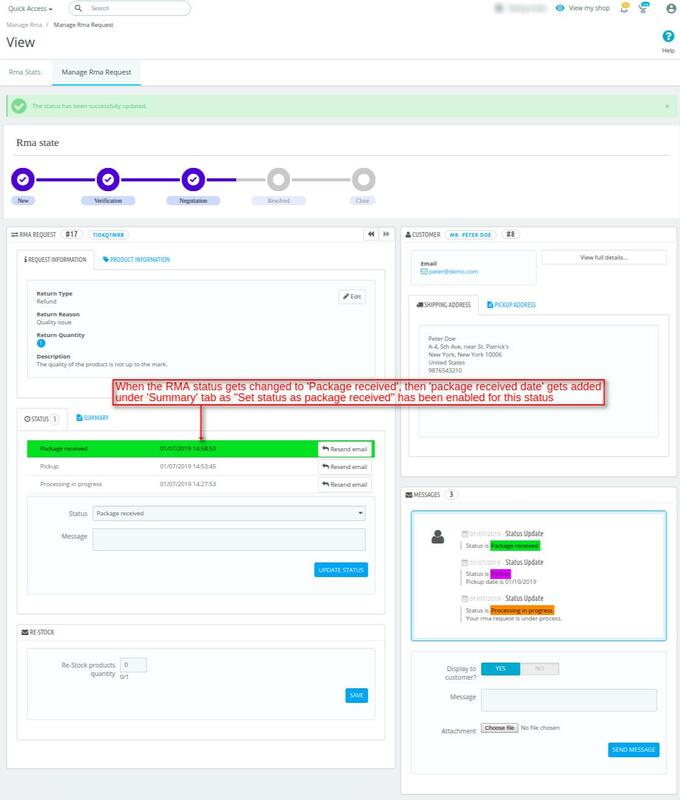 Under “RMA Guideline”, the store admin can enable/disable the pickup facility, enable/disable the display of guideline message, configure the guideline message, and select CMS page to be displayed in guideline message. Under “Mail Configuration”, the store admin can configure on which actions the email will be sent to admin and the customer. Enter the email id on which only the RMA requested email will be sent. Select the return address in case admin has disabled the pickup facility. Select the RMA status on which email regarding return address will be sent to the customer. If no email id is mentioned in the “Email” field, then RMA request mails will be sent to admin’s default email id. The store admin can assign RMA policy to the orders which have been received before the installation of the RMA module. Suppose admin has installed the RMA module on 20/12/2018 and the RMA policy is not applicable on the orders received before 20/12/2018. The store admin can specify the date range under “Update Policy” tab so that RMA policy will be applied on all the orders received during this period. Under “Statuses”, admin can add new RMA statuses which will be displayed to the customers at the front end. Admin can also add return reasons which will be displayed to the customer while raising RMA request. Admin can add new RMA status by clicking on “Add new RMA Status” button. Admin has to enter the status name and select the RMA state for that the status. If enabled for this status(pickup), then-then “pick up date” option gets available for admin when it changes the Status of RMA to this status(pickup). Suppose a customer has raised an RMA request. When admin changes the RMA status from ‘Processing in progress’ to ‘Pickup’, then a new option “Pickup Date” gets available for admin under ‘Message’ from where admin can set the pickup date of the product. If enabled for this status(Package received), then “package received date” gets added when admin changes the Status of RMA to this status(package received). If enabled for this status(refund initiated), then “refund details” options gets added when admin changes the Status of RMA to this status(refund initiated). Admin can add new reason for return by clicking on “Add new return reason” button. While adding a return reason, admin has enter reason name, select the return type for which this reason will be applicable. Under “Policies”, admin can add new RMA policy which will be applicable on the orders. Admin can add a new policy for return, refund, exchange, or repair on the store by clicking on “Add new policy” button. While adding a new RMA policy, admin can set the number of days within which the customer can request for refund, replacement, or repair from the day of delivery. Admin can also select the category(ies), and product(s) for which the RMA policy will be applicable. Refund – In this field, the store admin has to specify the number of days after delivery within which the customer has to return the product to get the refund. Replace – In this field, the store admin has to specify the number of days after delivery within which the customer can get his/her product(s) replaced. Repair – In this field, the store admin has to specify the number of days after delivery within which the customer can get his/her product(s) repaired. Once admin has saved the policy, it can view it under “Policies”. Suppose admin has assigned a 30 days RMA policy on “Women” category and a 15 days RMA policy on one of the products of women’s category, then a 15 days RMA policy will be applicable on the product. Note: On one product only one RMA policy will be applicable. After the successful installation of the module, a new tab ‘Dispute Manager’ gets available for the customers under “My Account” from where they can view the products for which they have requested RMA. 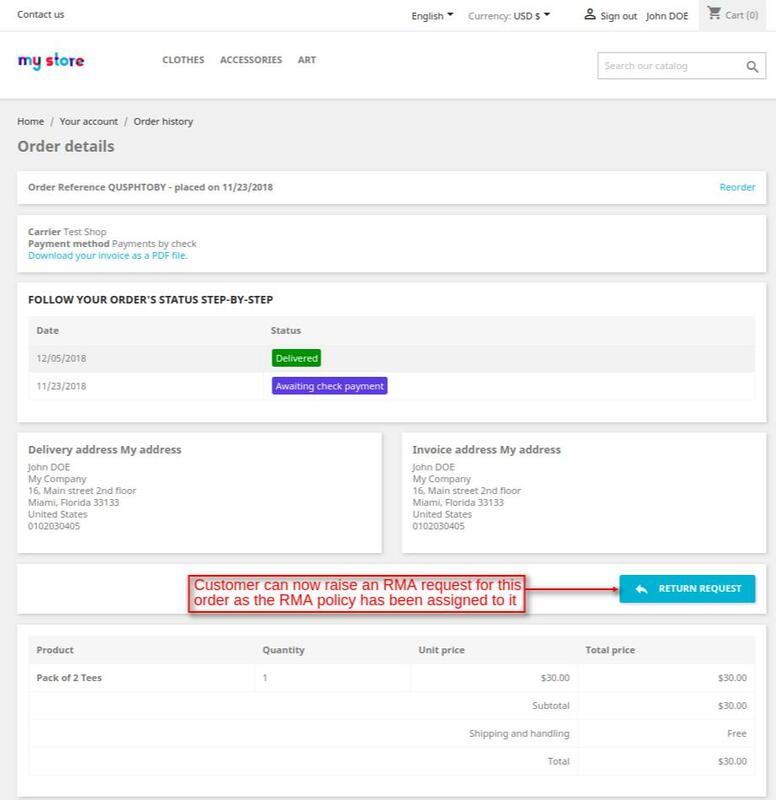 Once the customer has placed the order, then he/she can request for RMA when the status of an order changes to the status set by admin from the backend. 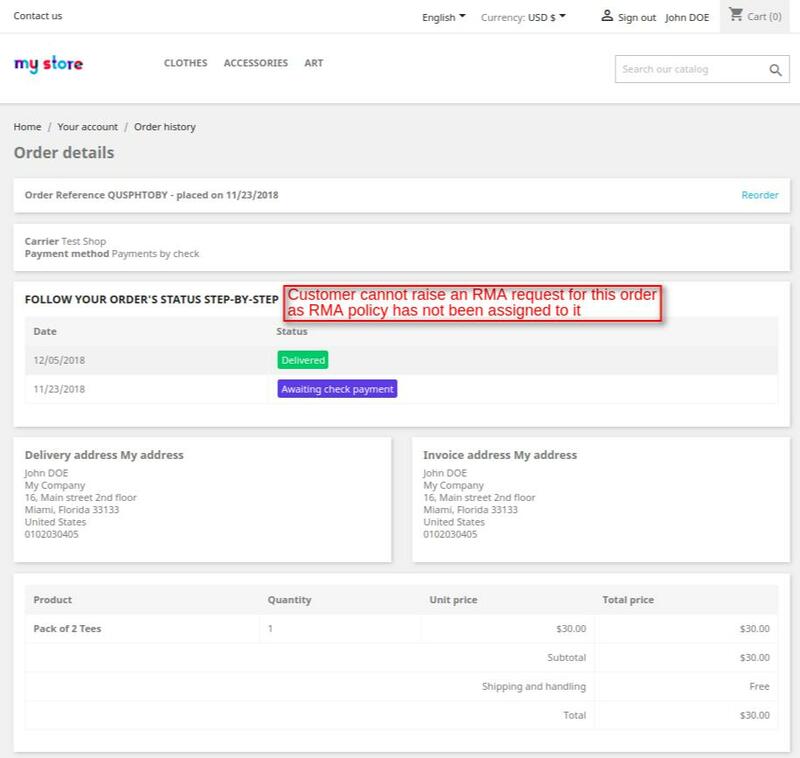 When the status of the order gets changed to the status selected by admin for placing an RMA request, then a “RETURN REQUEST” button will get available on ‘order details’ page. After clicking on “RETURN REQUEST” button, a ‘DISPUTE REQUEST’ form gets opened wherein the customer has to select the type and reason of return, pickup address, and enter the description. Once a customer has submitted the RMA request, an email notification will be sent to admin regarding RMA request and to the customer regarding the RMA status. After submitting the RMA request, a customer can view all the details regarding RMA, the current state of RMA on “Dispute Request” page. If admin has disabled the product pickup, then ‘Pickup Address’ field will not be displayed “DISPUTE REQUEST” form. After submitting RMA request the return address mentioned by admin in the backend will be sent to the customer in an email. The customer has to send the package to the address mentioned in an email. When a customer sends a message to admin on “Dispute Request” page, an email notification will be received by admin in which the customer’s message will be mentioned. 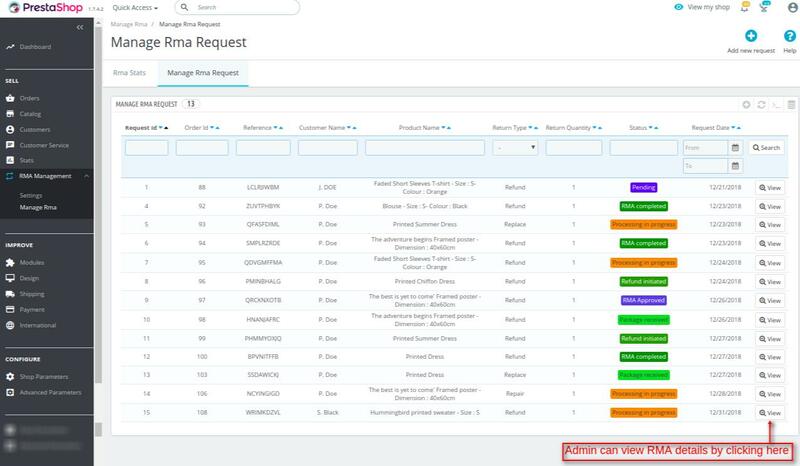 A customer can view all the RMA requests placed by him/her under “DISPUTE MANAGER” tab. 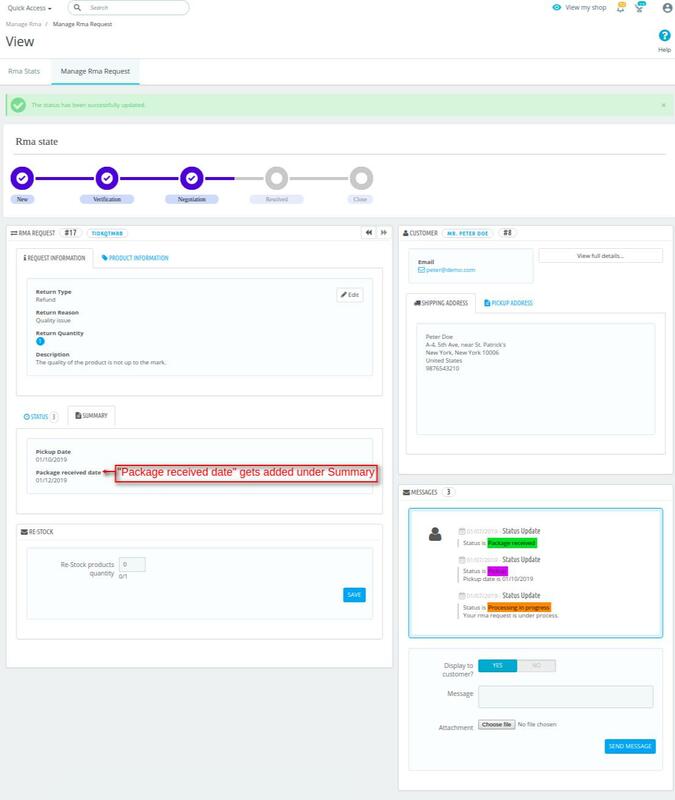 A customer can also raise RMA request for the order whose status has been converted to the status selected by admin from backend by clicking on “ADD NEW REQUEST” button. 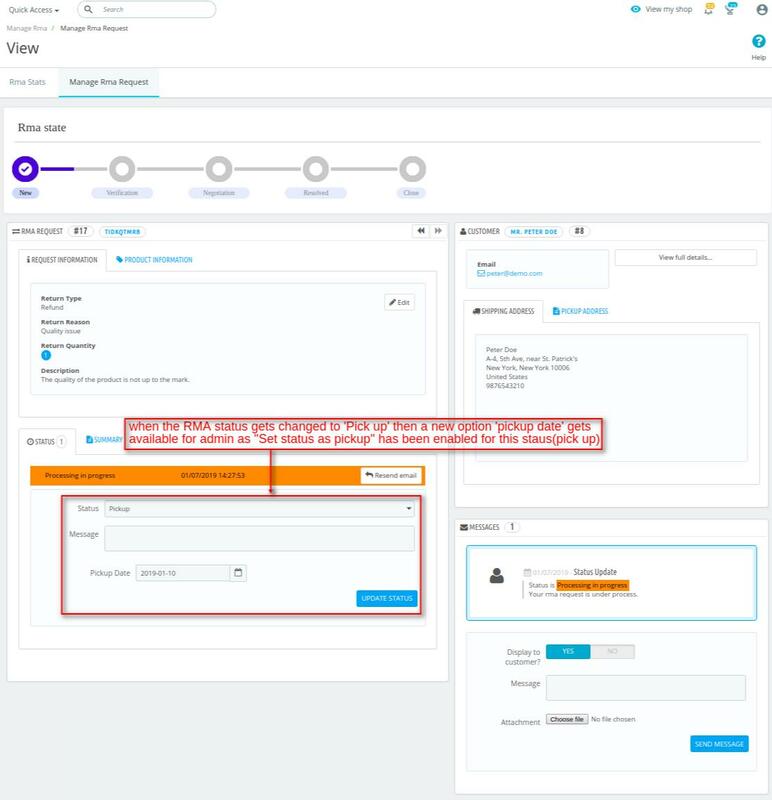 When a customer clicks on ‘Details’, dispute form gets opened from where a customer can raise an RMA request. After the installation of the module, a new tab “Guest RMA” gets added on the landing page of the store under “Your Account”. The guest customers can raise the RMA requests once the order status changes to the status required for placing RMA requests. When a guest customer clicks on ‘Details’ button, a DISPUTE REQUEST form gets opened on the screen from where the customer can request for RMA. Admin can view all the ‘RMA Requests placed’ and ‘RMS Stats’ under “Manage RMA” tab. Admin can view RMA state, RMA status, request details, product information, and customer information by clicking on “View” button. When admin sends a message to the customer, an email notification is sent to a customer and the customer can also view the message under “Dispute Request” tab on the front end. Admin can update the status of RMA under ‘Status’ tab of “View” page. The RMA state gets changed according to status added by admin for the particular RMA state. When admin updates the RMA status, an email notification is sent to the customer containing the message. The customer can view the message, updated RMA status, and updated RMA state under “Dispute Request” Page. Now, when the package gets received the RMA state gets changed according to the status added by admin for the particular RMA state. Once admin has updated the RMA status, customer can view the message sent by admin, updated RMA status, and updated RMA state under “Dispute Request” Page. After receiving the package admin can verify the product and initiate the refund process. Admin can make the full or partial refund for the product and shipping amount. After the refund has been processed, admin can now close the RMA request. Under “RMA Stats”, admin can view the number of RMA requests placed for refund, replacement, and repair graphically. Total number of customers who have placed RMA requests on the store. Total number of refund, replacement, and repair requests placed by the customers. Under “Product Wise Status”, admin can view the name of products for which RMA requests have been placed. Under “Customer Wise Status”, admin can view the total number of RMA requests placed by a particular customer. That’s all for Prestashop RMA still have any issue feel free to add a ticket and let us know your views to make the module better http://webkul.uvdesk.com/.